I realize it has been quite a while since I last posted a Motivational Monday post; I thought today would be a great day to start again. Through out the United States today there are events and celebrations to honor Dr. Martin Luther King, Jr. on what would have been his 83rd birthday. Some in our nation will be participating in the 26th Annual National Day of Service, others may just be enjoying the day off from school or work. But I hope that all are taking a moment to reflect on the values Dr. King stood for, and how those values are still very much relevant today. For Motivational Monday, I am sharing with you two quotes from the great Dr. Martin Luther King, Jr. 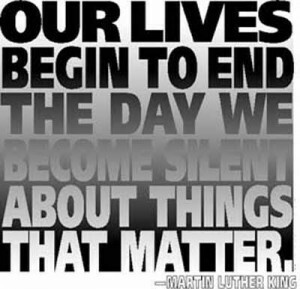 I don't want to sound political, as I am not one to speak out on political issues. I just hope to motivate some of you to start where you are to make a difference in your world. 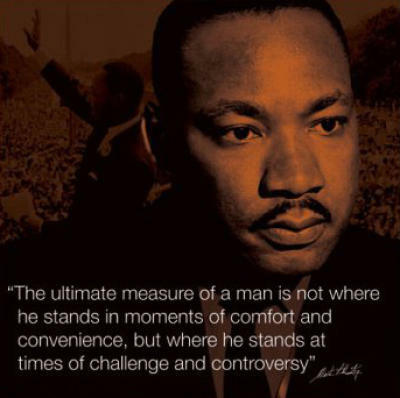 There have been great strides made towards Dr. King's dream of a nation of equality, but there is still much to be done. Today's political and economic climate in our country are hindering futher progress. This year (2012) is an election year in the United States. It is a chance for every citizen of this great nation to practice their right to voice their choices in the form a a vote. Whatever your political affiliation or view is, don't let your right go unexercised. If you are of voting age (which is 18, despite what some of our political hopefuls may believe or say), you need to make sure to get your vote counted. It is our one guaranteed way to make sure our voice is heard. The end result may not be what you chose, but at least you can say you made sure your voice counted.